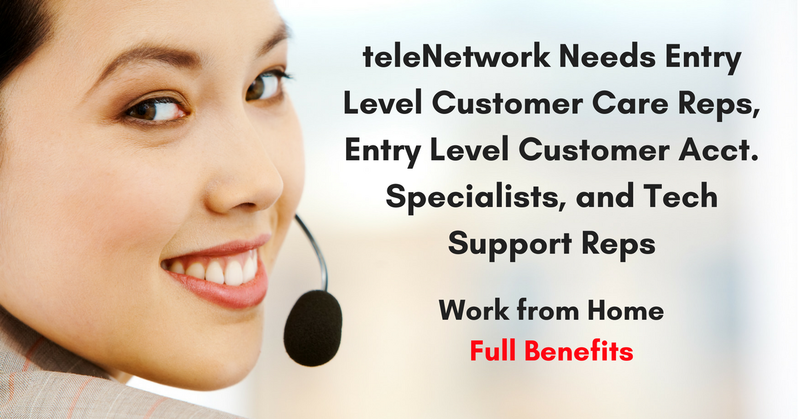 teleNetwork is a customer service company that is offering three types of legitimate work from home positions, all full-time — Customer Account Specialists, Tech Support Reps, and Customer Care Reps. Pay range $10-$15/hr. Paid virtual training. Benefits include life insurance, healthcare, 401(k), vision, dental, paid time off, holiday pay, company wellness program, paid parental leave, paid bereavement leave and more. teleNetwork is looking for customer advocates to join our team supporting the various needs of wireless service customers. This is an entry level technical, billing, and customer support position that requires genuine customer support ethics and a drive to make people rave about their great experiences. You will need excellent interpersonal skills and to be analytically minded, self-starting, detail oriented and skilled at solving problems and explaining issues. teleNetwork is seeking qualified applicants to provide technical support assistance to both businesses and consumers for Internet services, web hosting services, desktop support, and security related issues. Technicians must possess excellent customer service skills and the ability to build strong customer relationships on every call. Applicants should have excellent written and verbal communication skills, as well as great multitasking ability. teleNetwork is looking for customer advocates to join our team supporting various customer service needs. This is an entry level technical, billing, and customer support position that requires genuine customer support ethics and a drive to make people rave about their great experiences. You will need to possess excellent interpersonal skills and to be analytically minded, self-starting, detail oriented and skilled at solving problems and explaining advanced issues. Click here to see all jobs or on the following links for more information about the specific roles: Customer Account Specialist, Technical Support Representative, or Customer Care Representative. For more jobs like these, check our Newest Jobs & Gigs page. To be the first to hear about jobs like these, like our Facebook page and check your feed for our posts. May you be working from home soon! This entry was posted in Customer Service Jobs, Hiring Companies, Jobs with Benefits, Tech Support, Work at Home Jobs. Bookmark the permalink.